It’s Still a Huge Mess! The amount of damage and destruction still so evident was a huge surprise. It is time to rebuild! Hurricane Irma devastated several Caribbean island nations this past September, including Puerto Rico and the British Virgin Islands. The small building circled in red is missing the second floor, completely removed by the storm winds! 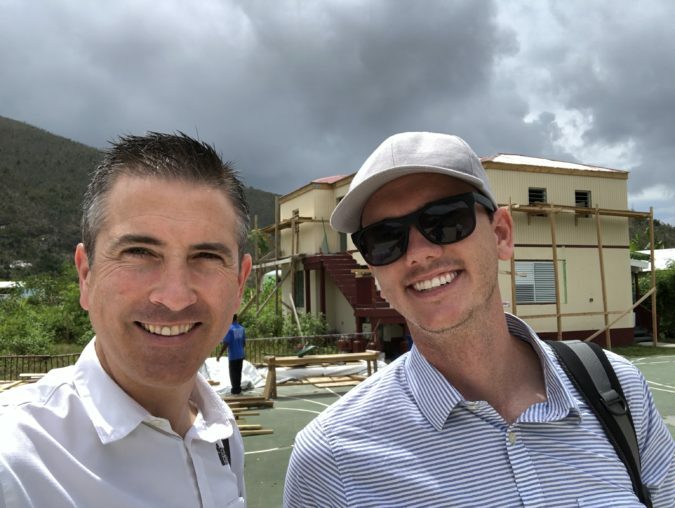 I am so excited about the opportunity for Builders International to partner with Convoy of Hope in some of the long-term recovery work to help rebuild in communities of the British Virgin Islands. 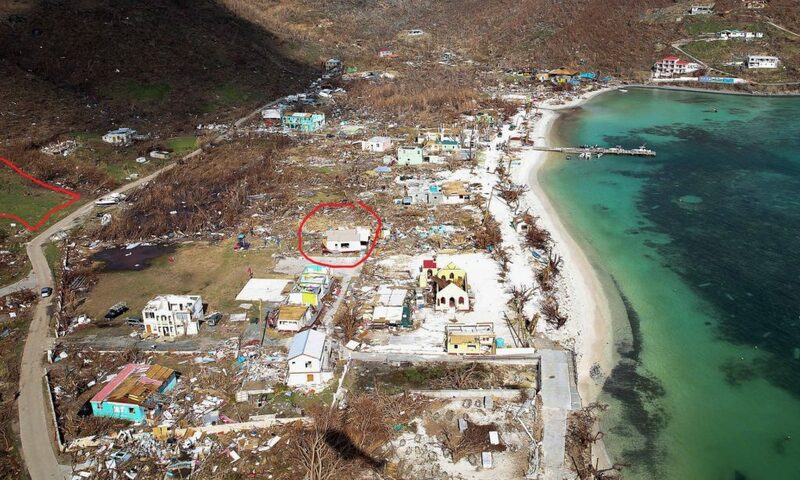 Builders International is working with Convoy of Hope to design and build a new school on this small British Virgin Island, completely devastated by Hurricane Irma last September! What an honor to have the opportunity to help rebuild this school…and make it better than ever! Thank you for enabling Team Moore in our work with Builders International! Ryan with Architect Chris Blackard in front of current school being patched up until the new school is built. Thank you, Ryan, for all you and your family are giving and doing for God’s Kingdom. We love you each. We love and thank you, Ryan and each of your family for giving all to reach the world for Christ. Thanks for the reports I receive and read. I travel to other nations to share the Gospel on my vacation time. I was praying about the Carribbean islands last year and was directed to go to Christchurch on the 7th anniversary of their devastating earthquake. Then I spent time in Rio witnessing on the journey home. When I was directed to these countries the hurricanes marched through the islands. Please keep me informed about the Jost Van Dyk work so that I may join a team and help out for a week or two when that comes together. If it is just serving and building that is fine. I usually try to plan my time off 9 to 12 months out. I am Gary Lukas, formerly of Friendship Assembly of God (during its first 49 years) and a former missionary church/planter to San Francisco. I also served as a missionary in London for over 4 years which is helpful when ministering among the former colonies or the Commmonwealth countries. We have met but it has been some time now. Thank you for touching base Gary! I appreciate hearing from you. I’ll give you a call. Thanks for the update. We love the work you guys are doing around the world. We are taking a disaster relief team with Convoy of Hope to Puerto Rico next Saturday, July 21. There is much to do in helping these people recover from this devastation. We will keep an eye out for future Builders/Convoy trips. Hope you have a safe trip to Puerto Rico! Great to hear from you. We so appreciate Evangel Bismarck and look forward to working with you more.